As for me, I was never really heckled. I think that American students are more mischievous, used to being a well-disciplined "good kid" at home, than they were drawn to mean-spirited heckling. [A footnote here says: A student wrote this to me: We sometimes are fussy but, honestly, all of us do love ya (=you!). Such a declaration of friendship would be inconceivable in Belgium!] Although there can be naughty heckling. My students were very surprised when I -- following standard Belgian practice -- made them stand up front at the board to recite the lesson! I had to give that up. My French classes went a whole lot better than my Latin ones: I only spoke French in them, as is appropriate. I have to say that I was understood almost better by my first year students than by my second year ones, who'd been taught a pronunciation by Mary that had a very distant connection to French, even that of my own ineradicable Walloon inflection. As for Latin, I had to conform to the pronunciation that Mary had used, since I only had second year students. I've already said elsewhere that Latin pronunciation is a reflection of your native language, although of course it presupposes a basic knowledge of the original language. Well, it's obvious that my students knew the nuances of English much better than their poor Latin teacher. This inverted the balance of power. Despite my long evenings of preparation, after exhausting days, I sometimes was legitimately called out by one or the other of my students, without hostility or mockery, but those times bewildered and dispirited me. Besides, I think that my Latin classes were somewhat less motivated than my French ones. It's important to know that all the courses of the three years of high school are electives. The school week is five days long, from Monday to Friday, without the midweek afternoon break [standard in France and Belgium] Each day consists of six periods of sixty minutes each, equally divided between morning and afternoon. There are no recesses such as we have. The students are only required to devote five periods to classes. They choose four subjects. The fifth, English, is the only required course. Thus, whether they choose chorus, geometry, algebra (the two of which are never taken together), biology, chemistry, "band," Spanish, etc., they have five hours per week in each subject all year long. But they aren't required to continue with a second year in any subject. Thus it is acceptable to take first year French as a "sophomore," first year Latin as a "junior," and as as "senior" -- the last year -- take biology without having had chemistry. They can quite easily finish their secondary education without taking any high school course in math, science, or history, with the exception of the "senior" year American history, a requirement just as is rhetoric in Belgium. Speaking of which, when Belgium later reformed its curriculum and introduced electives, it kept a lot more required subjects at the high school level, beginning with religion or ethics. There was not even a physical education class, properly speaking, in the daily schedule. Extracurricular sports took its place. There was no religion class, which was reserved for Sunday School. There was no daily prayer, unlike the situation in other schools, and which conservatives campaigned to bring back at the beginning of the 21st century! The intrusion of religion was limited to the half hour of preaching, on Monday, by one of a number of the city's "reverends," who took turns. The assembly took place in the gym. The thousand students and their teachers were required to sit in the bleachers, without exception. I admired the talent of these "preachers" -- all of them Protestant -- who had to deal with an unreceptive audience. Generally they'd start out in a folksy style by commenting on the latest football or basketball game and then cleverly draw from it a religious, moral lesson such as they had a mission to impart. The only period not given over to a class is spent either studying or fulfilling tasks auxiliary to the administration of the school. The study hall, always supervised by some teacher sitting way up front behind a big desk, adjoins a magnificent library directed by a professional, full time librarian, who has a number of assistants. The students come and go from their seats to the open stacks. This dream of a library and a librarian is present in all American schools and scandalously absent in almost all Belgian ones. There's no supervision -- outside that big tough teacher in charge of the classroom. No one is allowed on the premises before the designated hour, which is preceded by a salute to the flag, raised by two young boys. At the end of each class, the students spread out noisily in the hallways, which are walled with cabinets called "lockers." [In a footnote, Nicaise writes: These are individual metal clothes lockers that shut with a combination lock. Between classes, the students take from it the textbook for the next class. At the end of the day, eight out of ten of them keep their books and notebooks there and do no coursework at home. The satchel is an unknown accessory.] Couples meet up and go around hand-in-hand. The absence of general supervision is made up to some extent by the semi-permanent presence of a policeman assigned by the city, Mr. Coward, nicknamed Dutch. Besides making rounds of the outside of the building, he is he driving instructor for kids who are as young as fourteen years old. Normally the driving permit is given as soon as someone turns sixteen, but sometimes, in the cases of those without a father, it is given at fourteen! And in that situation only for the trip from home to either school or the supermarket! There were therefore not a few students who came to school by car. 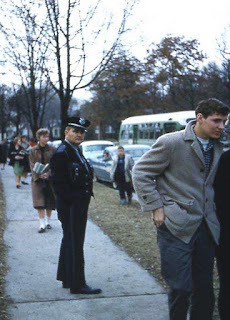 When they drove away, if Dutch wasn't around, like this, [a photograph shows a uniformed Mr. Coward] they would accelerate noisily and make their tires squeal to impress their buddies. Non-drivers all benefited from the service of the perfectly-organized school bus. All across America and even Canada, these buses are all the same, easily-seen yellow color. A federal law prohibits passing them when they are stopped, which is a wise provision. They pick up students from near their homes and return them there. The State of Tennessee, by statute, exempts from compulsory schooling those children who have to walk more than two miles to reach either the school bus or other public transportation. And yet out in the countryside that happens frequently enough. The mountain folk were quite often illiterate: the word designating them, Hillbillies -- for which a rough translation might be "good-for-nothings from the hills"-- is clearly pejorative.